Tobacco thrips (Frankiella fusca) are the most important vector of tomato spotted wilt virus (TSWV) in tobacco. Tobacco thrips have multiple generations per year and feed on a wide range of plants. 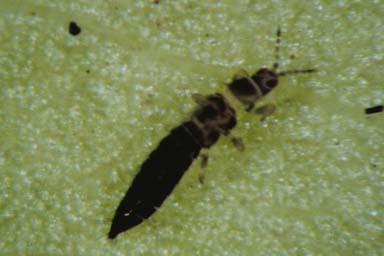 In order to transmit TSWV, thrips must feed on infected hosts as larvae. Losses due to TSWV vary greatly depending on year and location, with losses since 2000 in NC alone ranging from several million to over 45 million dollars per year. In addition to killing young plants, TSWV reduces the uniformity, yield, and leaf quality of infected plants that are not killed. Tools for managing TSWV in tobacco are limited and must be applied before TSWV spreads into the crop. Imidacloprid (Admire Pro®) and Actigard® applied to transplants in the float house are the most commonly used TSWV management measures. However, the level of TSWV control provided by these materials has been inconsistent. Field studies at multiple sites in NC and GA have confirmed the value of using both Admire Pro® and Actigard® in reducing losses to TSWV. Results demonstrated that condition of the plants when float bed applications of either product were made influenced the degree of phytotoxicity, with the highest and most persistent levels of phytotoxicity always associated with the weakest transplants. Phytotoxic effects of pre-transplant applications of Admire Pro® and Actigard® can be minimized by applying them separately at least 1 day apart. These studies confirmed that the greatest reduction in TSWV can be obtained when Admire Pro® (applied as a float tray treatment) and Actigard® are used, and demonstrated that the most effective application timing of Actigard® varies with year and location depending on when the spring flight of tobacco thrips and spread of TSWV occur. Field trials conducted by NCSU entomologists for the last 3 years and Clemson entomologists for the last 2 years have demonstrated that Actigard® treatments timed to thrips flights lower TSWV incidence. NC State University entomologists and climate scientists have developed a website designed to predict tobacco thrips (Frankliniella fusca) flights and make management recommendations to suppress tomato spotted wilt virus (TSWV) in tobacco. The TSWV and Thrips Exposure Tool for Tobacco uses temperature and precipitation data to predict tobacco thrips flight timing. The TSWV and Thrips Exposure Tool for Tobacco should be used by tobacco growers in high risk TSWV areas in North Carolina. An area is considered high risk if it has a historical average TSWV incidence over 10%. Distribution of tomato spotted wilt virus in North Carolina (based on county reports 1993-2008). The darker colors represent counties where TSWV incidence may be high (10 – 15%) in several fields every year. Figure from Mina Mila, 2011. Flue Cured Tobacco Information, Chapter 8. Managing Diseases. To use this tool, growers in high TSWV risk areas enter their location, tobacco type grown, anticipated transplant date, and any known or planned greenhouse treatments. The models then predict, based on grower location, if tobacco thrips are expected to fly within the next 2 weeks. If thrips flights are predicted, then the website suggests possible management options. For example, if the predicted flight is within 2 weeks of transplant, a greenhouse treatment of Actigard® will likely result in the greatest TSWV suppression. On the other hand, if the thrips flight is predicted 3 to 4 weeks after transplant, a field treatment of Actigard® may be most effective. Finally, if thrips are not expected until 8 weeks after transplant, treatment is likely not needed. Of course, whenever using pesticides, always read and follow the label. The label is the law! Thrips flight predictions are only available 2 weeks out at this time due to forecast data available. As weather forecasting tools improve, so will the prediction length.